Founded November 10, 1969, the Evening Garden Club of Corvallis has a long, rich and colorful history. 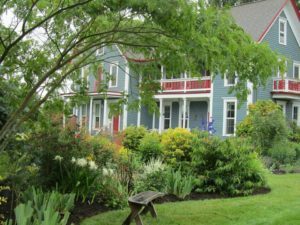 The garden club has been involved in the shaping of many gardens and gardening related events in Corvallis, furthering education, beautification projects in addition to providing grants for various community gardening projects. Most of the early club members were women who worked fulltime or who stayed home with young children during the day. Because of their daytime commitments, the founding members, with the help of the Corvallis Garden Club, formed a new group which chose to meet after the dinner hour. Individual members hosted the programs in their homes and held workshops in their garages, often with toddlers in attendance. On Saturdays in Avery Park, EGC sponsored a junior garden club. The club has evoled and now benefits from many male members. During its early years, EGC maintained plantings along the Willamette Riverfront; watering was a challenge with members required to bring in 100 feet of hose just to keep the plants alive! Shared gardening activities such as these built the lasting friendships which continue to thrive and grow within the present day membership. In 1964, when we first came to Corvallis, Oregon State University (OSU) had an interest group for newcomers. It was in that initial meeting that we signed a form for various groups that we were interested in. One choice we had was a gardening group. It was there that I met some of the early members of what later developed into the Evening Garden Club or also known as the Corvallis Evening Garden Club. My family and I moved into a new home with no landscaping in 1968 after that interest group had ended. There were many young families in the new homes with a keen interest in how to and what to plant in the garden. One day I saw an ad in the paper regarding the activities of Corvallis Garden Club (CGC) and a phone number to contact. I called the number and asked how we could get an evening garden club started, since I had our third child at that time and she was about three months old. Going to a day time garden club was a bit difficult. Evelyn Gawer was the President of CGC. She was so excited that we were interested in forming a new garden cub. I decided to invite my neighbors to a meeting and that is how I met Pam Hawkes (EGC Past President, 1978-80). The CGC provided speakers, plants, directions and anything else we needed to keep the group going. The first (1969) President of EGC was Gloria Wood. I had met her at the OSU interest group and discovered that she had been in a floral design guild in California. Learning to grow and design the array of beautiful plants and flowers here was of special interest to me. In 1974, I finished Flower Show School and certified as an Oregon State Federation of Garden Clubs Flower Show Judge. As my life progressed, I went back to work and years later when I was thinking about retiring, my thoughts once again turned to the fun of garden club. I joined CGC and in 1994, I certified once again as an OSFGC Flower Show Judge. Presently, I am a Master Flower Show Judge and recently judged the Strawberry Festival in Lebanon. I would be happy to introduce you to the study of design and horticulture with Flower Show procedure when an opportunity arises. Who knows perhaps you will decide to become an OSFGC Flower Show Judge!